Among the many backyard birds, flinches are one of the smallest yet they can be the cutest. They come in several colors of red, orange and bright golden yellow. Because of their beautiful colors, they are one of the most sought after birds of bird watchers. To attract such a beauty into your yard, you need to find the best finch feeder. A look at the pet shop will give you lots of information on which one to buy, at times it can even be a bit confusing so reading up on other people’s experiences can be of great help. Finches have very unique bills adapted to eating smaller seeds. This means that feeding them can be either simple or tricky. Their colors depends on their diet so if you want to see healthy colors in your finches, you need to offer variety of food. There are many choices of feeders but there are some that have been rated well by expert bird watchers. So, even if you are a beginner, it would be easy to please the birds and keep them coming back for more. There are many ways to attracting finches to your backyard, some easy and some ultra hard. The bright yellow American gold finches are not just beautiful but they are very entertaining to watch and to top it all, they are relatively easy to attract. No wonder, they are the favorites of birders especially in the North American region. This bright yellow birds change colors too, depending on diet and weather. So getting a golden finch at the summer may mean getting the same bird in dull green during winter. To attract as many finches as possible, the Stokes Select little-bit feeders finch bird feeder with metal roof is probably your best choice. This metal feeder is designed to keep your finch fed by providing them with balanced nutrition. You can mix seeds and the birds can eat from any angle so they can get variety of seeds, important to keep their colors alive. Stokes Select created beautiful bird feeders. They are not only practical but economical as well. Constructed with durable, high-density plastic and metal combo, the feeder will not rust and can withstand any type of weather. Thistle seeds are perfect for small-billed seed eating birds like the goldfinches. So, if you are trying to attract these bright yellow-feathered friends, then you should stick to filling your feeder with thistle seeds. If you intend to have them having fun while feeding, then the Perky-pet 399 patented upside down thistle feeder is your ultimate choice. Not only it is pretty but it also the perfect size if you wish to see many birds perching and eating at the same time. Because it has upside down feeding ports, you’ll have a chance to watch 8 or more birds in acrobatics while they are getting their fill. While feeding them is the priority, making sure that the bully birds will not get a share of the meal is important too. 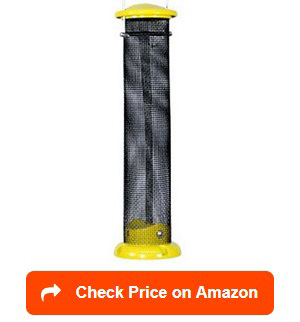 Since the ports are intended for the small finches bill, then the Perky-pet 399 is big bird proof. 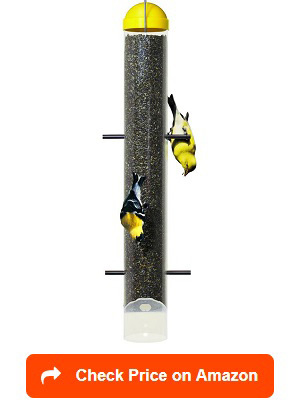 For a price lower than most feeders, this could be the best gold finch feeder available with both design and functionality. 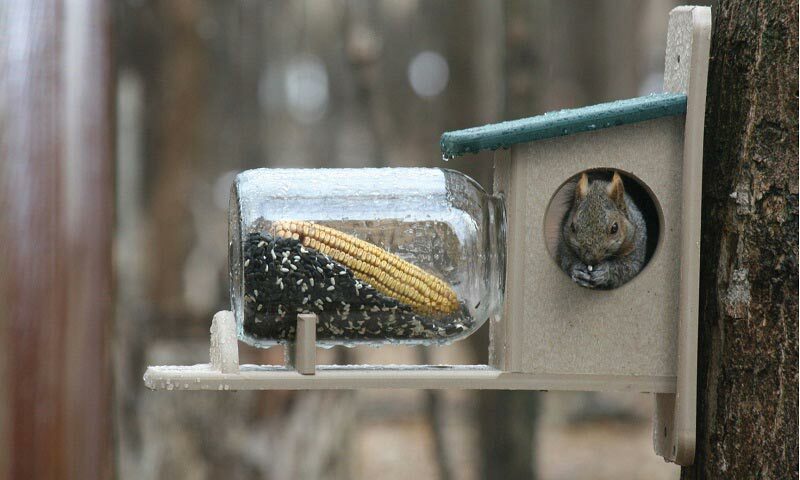 While the feeder claims that it is weather proof, the plastic cap might not be suitable for extreme weather changes. The hot temperature may also alter the yellow cap into white after sometime. The yellow color attracts finches. Perky-pet sure have a lot of perks. Boasting of no plastic and no wood in any part of feeder, the Perky-Pet GB5F00340 Finch Feeder is worth every bit the price. While it may be a little costly than most feeders, it last longer (even years) before you even need a replacement. I have used homemade finch sock feeders in the past and they seem to work great but I personally like this feeder better for two reasons: sustainability and durability. It is not only environment friendly but it will last a long time. 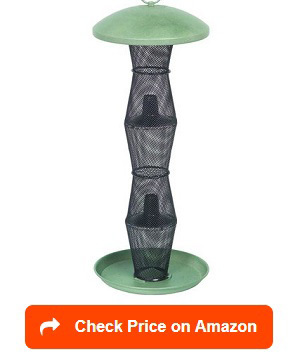 The feeder features a unique mesh design perfect for birds to cling or to perch so you will get to see many birds in action at a given time. The mesh design also distributes the birdseeds evenly. Seasoned bird enthusiast rated this a 5 out of 5 for its functionality. The birds can eat from all sides while the squirrels are barred by the baffler top made of stainless steel. To avoid messing up bird seeds, a tray made of the same material as the baffler is placed at the bottom. The birds can eat the seeds on the tray after. And since it has no wood component, there is no worry for molding or rotting because of its exposure to the elements: wind, air, rain or the sun. The Perky-pet will surely keep the birds happy and fed for a long time. It is easy to clean. Dishwasher friendly. The mesh gives all birds a chance to eat at once. Even for expert birders, there’s nothing more delightful than getting a hand of a feeder that is both practical and cost-efficient. It also means a feeder should be able to attract not only one kind of finches but as many as possible. That’s the whole point of birding—to see varied colors and enjoy the birds in action. To have all these, Stokes Select 38171 Feeder is your best bet. It has a very simple design similar to a soda bottle finch feeder but definitely more functional than that. Designed with a durable top and bottom bafflers, this bird feeder attracts goldfinches, house and purple finches and pink siskins among others. Smaller birds with small bills can also join in the feast. With a capacity of 1.1 lb of seeds, thistle and finch mix, it can feed multiple finches at once as long as they cling to the screen or perch of the bottom tray. It is no wonder expert bird watchers rated it high in the 5’s. And because it is made of wired mesh, the seeds are well protected from big birds and squirrels. The tray area gets filled with seeds at some point, which the finches would nibble after. If there are some extras, it would be great to put it on the ground for the ground feeders to forage on. Can mix thistle and finch mix for better nutrition. Easy to fill with seeds. Just twist the top baffler. Allows clinging and perching bird to eat. Do you have more finches than you can manage? Then you need a longer feeder. Depending on where you are, finches can come in droves so giving them enough space to enjoy their food is crucial. 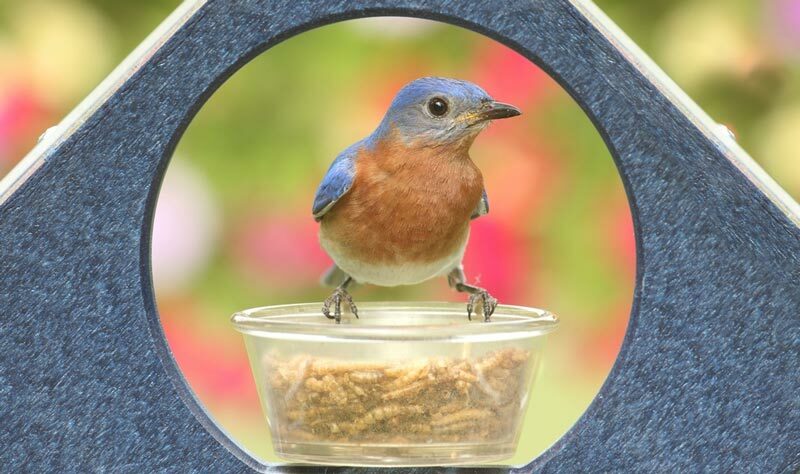 Not only feeding time should be fun for the birds, it should be fun for the bird watcher as well. Giving them all the chance to eat without fighting for space will surely make your bird watching experience a lot more fun as well. To remedy this, the best thistle feeder you can find is the Droll Yankees CJTHM36Y Feeder for Finches. It is an elongated feeder with perches to provide comfort to all birds during the feeding time. The beauty of this thistle feeder is not just its design but because the metal tops and bases are made of zinc, it will last a lifetime. Considering its relatively higher price as compared to other feeders, this is the most practical one birders can have so far. With the droll Yankees, you can have 15 to 20 goldfinches feasting on your thistle all at once. This Yankees, measuring 36-inch is long enough to be hanged under the trees or for a more beautiful spot, by the window. Claiming to last a lifetime, the UV-stabilized, clear polycarbonate is sure to last for a long time, and will never discolor, making it worth every dollar. The only downside of this product is probably its many ports, 20 in total, which means that when finches come in droves, you have no choice but to fill it often. So unless you live near a seed shop, you probably need to keep some supply to make these feathery-friends that are thistle addicts happy. Many companies claim to create beautiful and functional feeders. That’s great! But very few keep their promise. Sometimes, even seemingly effective feeders fail for many reasons. In addition to actual functionality of the feeder, finding the best place to hang your feeder is very important. Can the finches spot it at once? I think that long feeders occupy too much space while feeders with complicated design does not look classy in the yard. At the end of the day, like many birders, you would want your feeder to add more character to the yellow, red and pink finches you so badly want to watch. For this, I believe that the Woodlink MINIMAG2 Nyjer Feeder is going to be a good choice. Its simple design complements all backyard aesthetic. 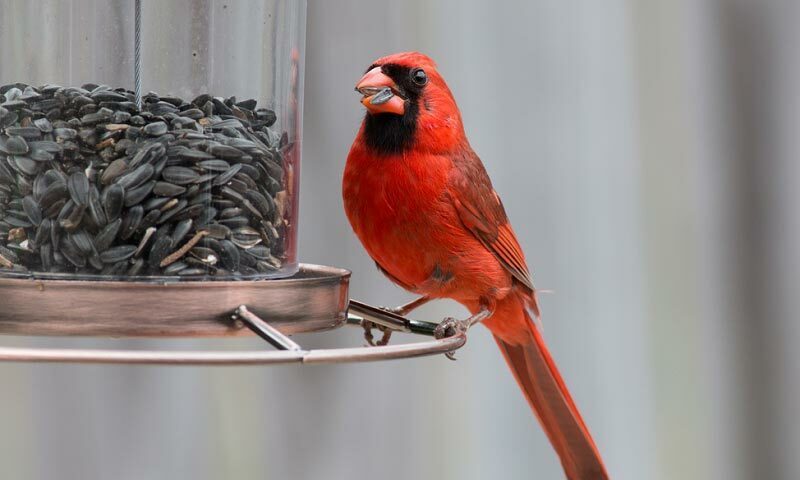 In addition to the metal mesh and stainless tray, used by clinging or perching finches, the Woodlink holsds at least ¾ pounds of seed, leaving you plenty of time to enjoy the feeding before it calls for refill. 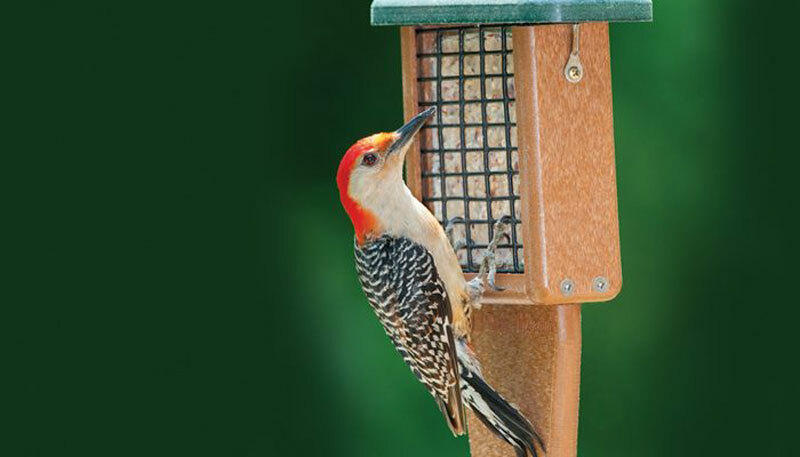 A mid-range feeder, the woodlink’s size is just perfect for the birds to finish the seeds before they get moldy – a major issue of feeders that are either too big or too long. This especially happens when birds become scarce in winter or in hot summer, when they are nesting. 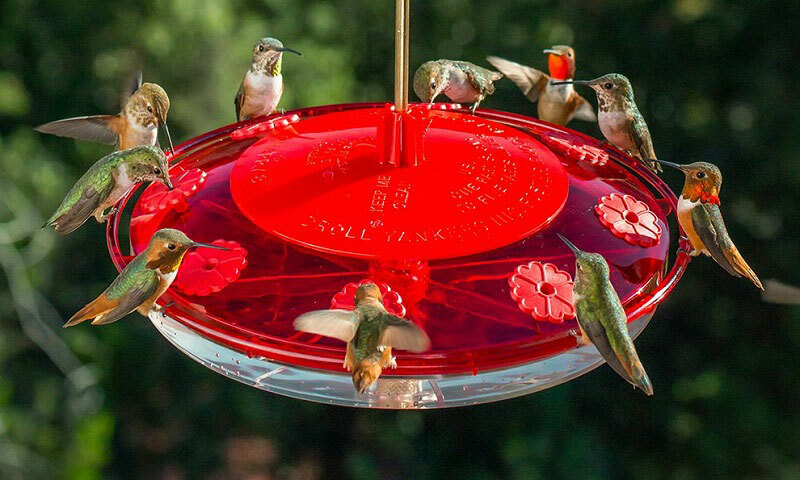 Bird experts rated the woodlink feeder as 5 for its durability, functionality, and price. Bird feeding is a great hobby but it can also be demanding. This is especially true during the spring, when they all come looking for great food. Finches are one of the easiest to attract and for many years, bird watchers have tried many ways to get them to keep on coming back for more. Traditional bird feeders are out there for keeps. The Kaytee Finch Sock Feeder Twin Pack, 26 oz has proven its worth and it is also an easier way to attract finches into your backyard. 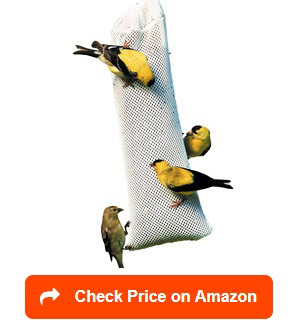 The feeder sock, designed like a mesh bag, is a great way to feed the finches over plastic feeders, as it is not too hard for the bill of the finches. 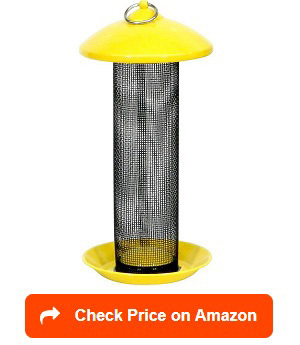 The Kaytee Finch Sock Feeder Twin Pack, 26 oz can be placed anywhere the finches can see. 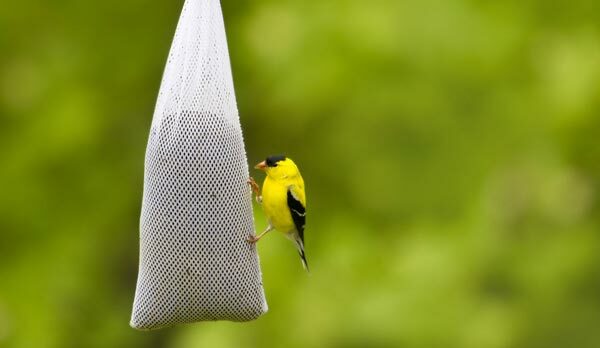 The mesh bag is perfect for golden finch and other small-billed birds. The Kaytee feeder can withstand all weather and the thistle inside does not rot easily even after exposure to the harsh elements. 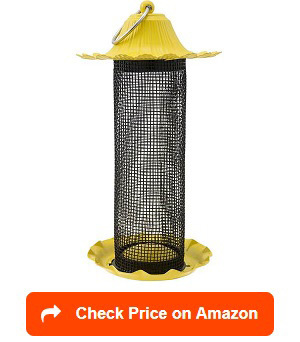 As a bird watcher, the only downside of this product is when birds start to tear the cloth, resulting to spills. The tube type finch feeder has not lost its touch. This is made true by the Woodlink NAWLNT finch feeder, which is designed to attract finches without a problem. The finch feeder is easy to use, easy to assemble, and can hold up to one pound of finch seeds or finch mix. With its mid-range price among the many feeders out there, this simple tube type, aluminum mesh feeder does its work without much hassle. The finches love it as they can enjoy feasting on the thistle feeds from all side of the tube. While they are clinging to the mesh, you can also enjoy a full view of the birds-in-action. The Woodlink NAWLNT Audubon is also squirrel proof so the precious thistle seeds are only for the finches. Since it is made of aluminum, it can last for a long time. While I love the product, the only downside is the yellow cap and bottom, which are made of plastic and discolors after sometime. The base could have been more helpful if it was a small tray to catch the excess seeds. Oh well, the ground feeders do have a feast as well. All in all, the WOODLINK is worth the price. With anything yellow, the finches are surprisingly easy to attract – the brighter the yellow is, the better the result too! No wonder manufacturers like bird quest created everything using a bright yellow design, including the perches. 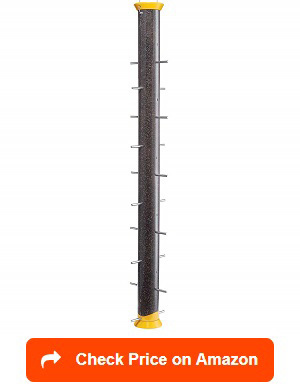 The Bird Quest SBF2Y 17” Thistle Feeder – Yellow is not just a beauty but practical and functional. 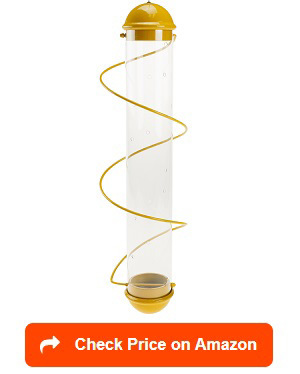 The 17-inch tube finch feeder has a spiral-designed perches keeping the finches steady while feeding. The design also allows more birds to feed. While it is priced a bit more than most products, the durability, the functionality and the well crafted design of this the Bird Quest are enough reason to have this as an addition to your bird feeding hobby. Unlike traditional sock feeders, the Bird Quest Spiral Thistle is made of aluminum of stainless attached to a clear molded sees tube making it easier to monitor. The nine thistle ports are strategically placed for you to enjoy the finches sliding down from port to port. The locking lid of the bird quest spiral thistle is also a come on. 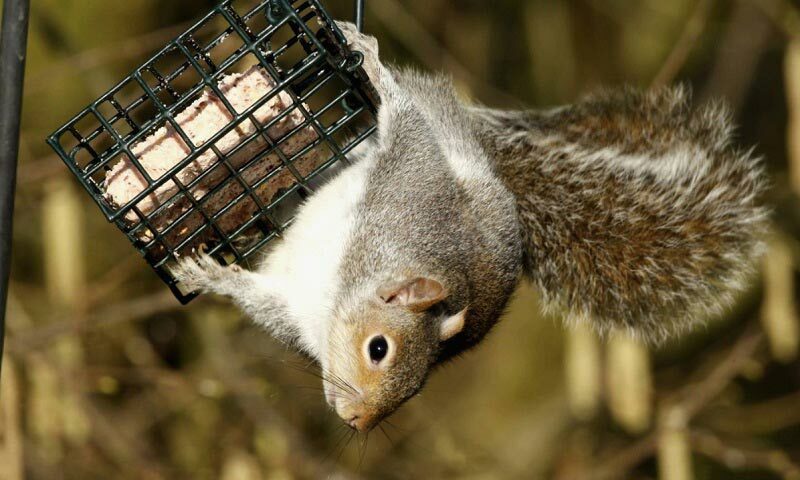 This deter squirrels, insects or other birds from coming over, messing the feeding feeder and scaring finches away. Because it has small holes, other birds with similarly smaller bills are fond of playing along in the spiral perch, giving you an exquisite bird watching experience. The birds love the spiral design perches. Want more feathery friends to come visit your thistle feeder? Then perhaps a the Woodlink NATUBE5 Feeder is the right one for you. Not only it is durable, with it’s copper design but it is also so easy to mount and to fill. Since it is only 4 ports, finches may have to fight for space at some point. It’s height of only 13.5 inches means that it is small enough to be hanged beautifully in your patio or porch. It will also give you a better view of the birds while they are perching or in a feeding frenzy. Expert birders rated the Woodlink NATUBE5 as 5 for many of its great features: bottom mount (not always for hanging), the bottom comes off easily too for easy cleaning and it is beautifully designed, in an antique looking yet perfect for a quaint garden, copper material. Its flat bottom allows the feeder to stand as long as there’s enough support. The perches are great for the birds as they can feed peacefully. While it looks perfect and practical hence it is priced higher than most, there’s only one downside for the woodlink Natube5 – it needs a tray for the loose thistles. When a feeder is hanged up in the air and without a catch tray, then the ground feeders will surely come to help out finish off food. Unless you like droves of birds coming to your house, then you can avoid this by letting it stand on one. If it is hanging, then you better place it in an area that requires less cleaning. You wouldn’t like bird poops all over your patio. Beautiful copper design. Good for small backyard. If you hang it, great. If you let stand on something, good too! Before you embark on the hobby of bird feeding, let us first understand the kind of bird you are trying to attract. Finches are endemic in North America, which means that they are exposed to various weathers all year round. This is the beauty of finches; they change colors as the weather changes too! 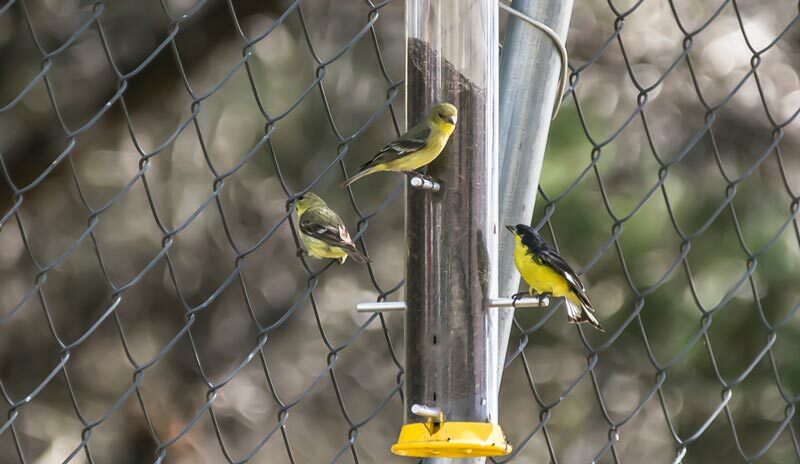 When they arrive in the spring, we need to put up finch feeders, usually made of durable plastic or metal mesh to provide the finches a chance to peck on the feeder without much hassle. Since finches love to perch, some feeders have they own stick for perching and clinging. These will provide the birds peace when they feed on your prepared thistle seeds. 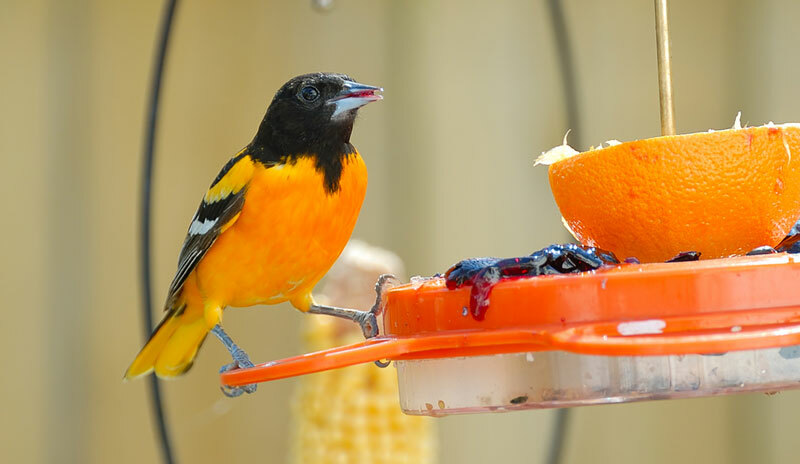 Because of its cost, most birders are always worried about seed stealers like other birds or other pesky rodents so investing on a good, reliable, and durable finch feeder is important. Choosing the right feeder is the first step to really take care of the finches nutrition and well-being. Finch seeds are very small, thistle or nyjer, it will mean it needs a special feeder to hold it yet accessible enough for the finches to feast on. Tube Feeders: Probably the most common type of finch feeders in terms of shape and functionality. The only difference is that these tube feeders are sizes of port, number of ports and top and bottom design to hold the expensive thistle seed well. Most tube feeders have a very small opening to keep the seeds in tact even when the finches shake it hard during feeding time. Tube feeders are great at accommodating more birds at once. Rotating Port feeder: This unique system of feeding the finches is not just great for the birds but it provides a better bird watching experience. You can decide to have the perch below ports or above it to thistle to all your feathery guests. They can also eat upside down like gold finches. Mesh feeder: Another popular thistle feeder and it’s functionality is unmatched so far. It offers not just perching birds but clinging ones too. The mesh, usually made of metal, is study and rust free. Since the mesh also serve as its ports, the birds can feast on the thistle all at once. The diamond shaped mesh prevents the precious seeds from falling off. Sock feeders: This is an oldie but goodie kind of system. The finch or thistle socks are friendly to the birds. They are designed to have a large surface for the finch to cling or perch to while feeding. The only downside is the material used – soft fabric mesh that can get dirty or damaged after few just months. All bird watchers, old and new know that finches can choose to be elusive, at times. Putting up the feeder in the right place, with the right food and even the right color will provide them more reasons to come and partake on your prepared feast. Go for Yellow. 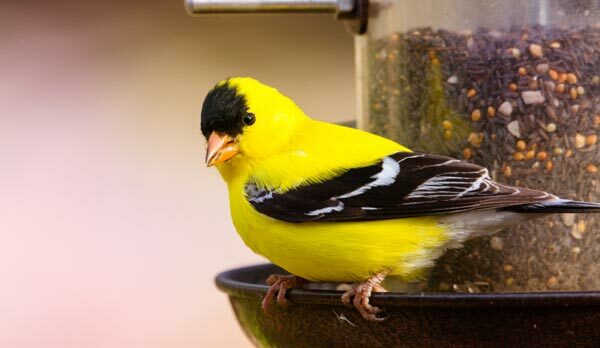 Finches are attracted to the color yellow. This means that using them in your backyard does not only provide a beautiful contrast of colors but also give your feeder that edge to invite the right bird—the golden yellow, red or pink finches. The metal mesh. This is a guiding principle. Get a feeder with enough wired mesh to allow the small bills of the finch to reach the thistle seeds. Metal mesh feeders great because they are rust free, rodents proof and certainly last for a long time. Size matters. Some finch bird feeders are big enough to carry few pounds of thistle seeds. During the winter months, this kind is you go to feeder. Imagine going out in the middle of cold to fill a feeder. Remember that most birds eat half of what they weigh and eats as regularly as possible. Avoid messy ones. Because thistle seeds are very small, it is very likely that they’ll fall off from the mesh or even from the plastic tube. Some finch feeders have trays attached to the bottom of the feeder to keep the seeds from falling to the ground. Having ground feeders waiting for the seeds can be a nuisance and if not cleaned up well, the rodents will surely come next. Getting a finch feeder is not enough. You need to know exactly what specific birds are you attracting to know which feeder is perfect, where to place it to attract the finch and how to mix seeds. 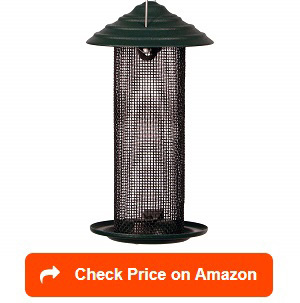 As a starter, you can put thistle in specially designed finch feeder – store bought—metal mesh are the best options. Fill it up with thistle seeds and hang it in a place that can be seen clearly, both by the finches and you. As a rule of thumb, hang your finch feeder at least 15 feet away from water sources and from other feeders. Lastly, make sure squirrels (although they are not attracted to thistles), or cats and dogs will not be able to reach the feeder. Best places to hang finch feeders? When finches decide to stay in one place, they refuse to migrate somewhere else. This means that once the finches find your yard, they might keep on coming back for more. Hence, keeping the feeder full as well as clean or sterilized will also keep the feathery guests become regulars in your yard. The placement of your feeder is as important as the feeder itself. 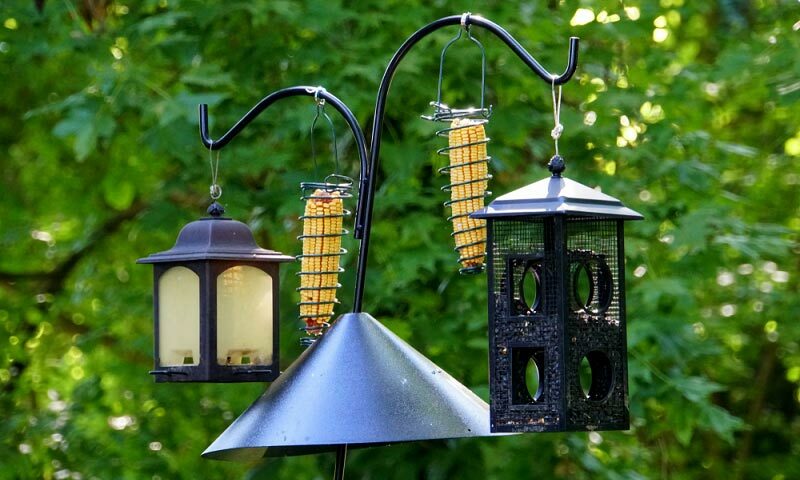 For better result, you can hang the feeder near the porch, patio, or a window with a view that is overlooking a landscaped area. What is important is that the location should have a clear view that is both friendly to the finches and you. An open space is advisable. Experts however warned that keeping a distance between the ground and the feeder, about 5 to 8 feet to protect them from predators. 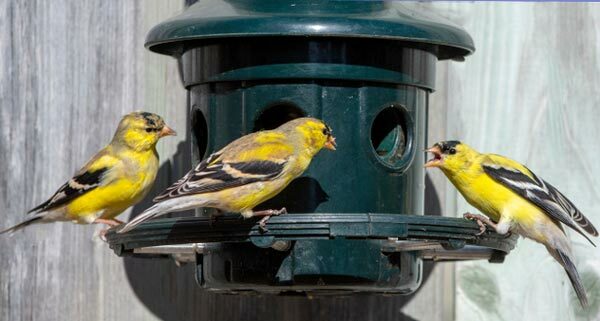 Finches are easy to attract but if you want them to keep coming or stay somewhere in your yard for the nesting/breeding season, there are few things you can do. Plant shrubs so birds like yellow finches can create or build a nest on top of them. Finches likes to nest in open fields overlooking water source or rivers. Provide enough spaces between shrubs so that finches don’t overcrowd during the nesting season. Flowers are great not only for your garden but for finches as well. Planting wild flowers and thistles will give them more food sources aside from the thistle feeder. You may be surprised to see finches staying longer even after the breeding season. Choose your perfect feeder. Having enough features for perching, clinging and ports are necessary. 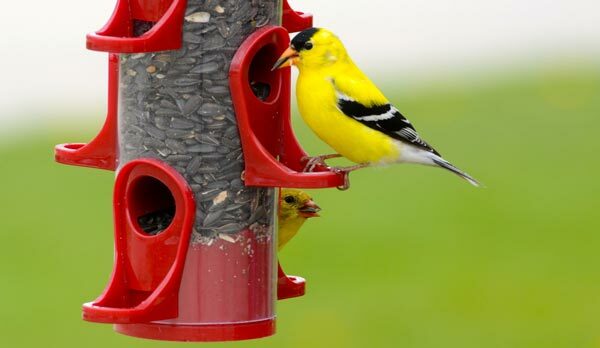 Go for yellow, durable and desirable feeders. What is the best seed for finches? Want to enjoy the beautiful colors of the finches, then their diet is of importance. For this, provide the finches with Wagner’s 62050 Nyjer Seed Bird Food, 10-Pound bag is the best in the market. 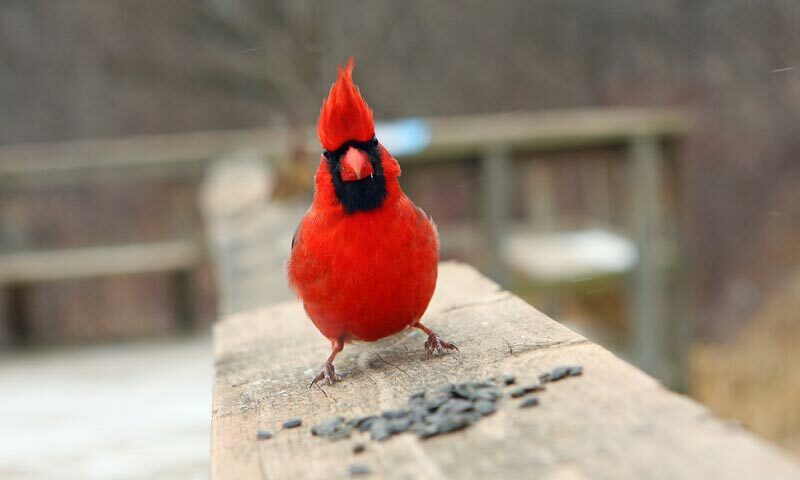 A large bag of this nutritious seed will surely create many visits to the feeder. Thistle seeds are expensive so making sure that you have the right one that finches will love can spell success and failure of your bird feeding hobby. Get a clear plastic tube with a tight cap. Drill the tube to make ports. Depending on how many finches you wish to see feeding at once, then you can drill every 4 inches. You can also add some more holes, insert a plastic stick and create nice perches. Fill it up with the thistle seed. Hang it up and watch the finches go crazy. 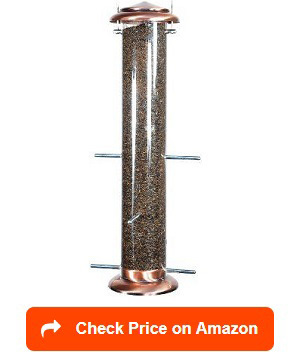 Whether you are hanging the feeder because you feel bad for the finches or you have turned bird feeding into a hobby, the first step to enjoy this activity is to make sure that you can attract as many finches into your yard with the best finch feeder you can possibly find. Finches are beautiful bird. Their bright colors of red, yellow and orange are the result of the carotenoids acquired from their diet. Male finches also use these colors to attract their mates. To keep the finches beautiful colors, choosing the right seed and finch feeder, the best location to hang your feeder, the best ways to protect your feeder from predators and the best design to last the harsh weather are just few things you may wish to consider once you finally decided to be a birder.